Carbon 12 is a new boutique condo building ushering in a new standard in sustainable building. The innovative building uses renewable building material and boasts a uniquely engineered frame that makes it among the most seismically prepared buildings in the country. 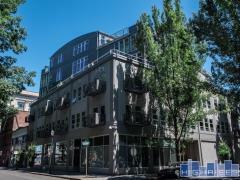 Located where the Mississippi District and the Williams Corridor meet, the building consists of an exclusive 14 units with private elevators, balconies with expansive mountain and city views, private entry foyer, and a high tech mechanized parking valet. Have any comments or questions about Carbon 12? Ask your question and/or share your thoughts about this Building.